Weir is a village to the north of Bacup in the Rossendale borough of Lancashire, England, with a population of 1,251 at the 2011 Census. Anciently, Weir constituted a hamlet, but later emerged as an outlying suburb of Bacup town after the Burnley Road turnpike was built through the settlement at the end of the 18th Century. Weir straddles the A671 road and is located by Deerplay Moor, the source of the River Irwell, and adjacent to the parish of Cliviger. Weir is serviced by Northern Primary School in Broadclough, has a church and community centre (the Doals Centre), a cafe-bar (Anna's), and a pop-up restaurant (Twos and Threes Hideaway). Weir previously had two pubs, the Weir Hotel and the New Deerplay (once the 12th highest pub in England at 1,310 ft), both of which are to be residential developments. Weir has an active voluntary group, Weir Pride, which holds monthly meetings and arranges litter picks, floral displays and planting around the village, as well as organising community activities. Weir has a football team named A.F.C. Weir, formed in 2010, who compete in the Burnley Miners Burnley and District Sunday league. Their highest finish was second in the 2013/14 season. They also won the Harry Briggs memorial trophy that season, beating Craven 4-0 with two goals each from Luke Dempsey and Ryan Nuttall. Stewart Haslam won a debatable, controversial[according to whom?] Man-of-the-Match. They play their home games at Towneley Playing Fields. There have been several attempts to further develop Weir and neighbouring Broadclough. The land on the boundary of Weir, adjacent to Broadclough Farm has had several attempts at development including a 61 home plan as well as an 80-bed residential care unit. However to date these have been refused the main concern being loss of the open moorland/countryside surrounding the settlement. In June 2014 the police announced they would be monitoring the road between Weir and Bacup (which passes through Broadclough) as it has become an accident blackspot. Michael Carr, a Liberal Democrat politician and former Member of Parliament for the Ribble Valley, is a resident of Weir. 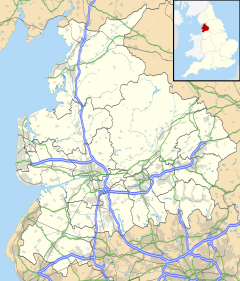 ^ "Weir (Lancashire, North West England, United Kingdom) - Population Statistics and Location in Maps and Charts". www.citypopulation.de. Retrieved 15 April 2016. ^ "Bacup Northern Council School". ^ "Highest pubs in the UK". www.garydickson.co.uk. Retrieved 19 April 2016. ^ "Pub to be demolished for new houses". Lancashire Telegraph. ^ "Closed Hilltop Pub Set To Be Converted Into Four Houses". Lancashire Telegraph. ^ "Weir Pride". www.facebook.com. Retrieved 17 September 2018. ^ "Burnley Miners Burnley and District Sunday League - Fixtures and Results". www.leaguewebsite.co.uk. Retrieved 15 April 2016. ^ "Plans Build 61 Homes Rejected". Rossendale Free Press. ^ "Specialist Dementia Unit Refused". Rossendale Planning Department. ^ "Woman Cut Free After Bacup Crash". The Bolton News. ^ "RTC in Weir Bacup at 1604hrs". Lancashire Fire and Rescue. ^ "Villagers face new moor mine battle". Lancashire Evening Telegraph. Newsquest Media Group. 16 November 1999. Retrieved 29 September 2008. This page was last edited on 20 October 2018, at 17:06 (UTC).